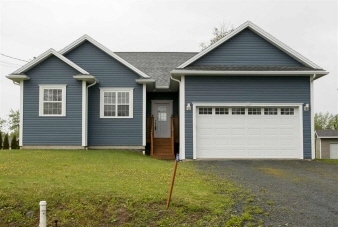 Description: Modern open-concept carpet-free 4-br bungalow on municipal services & large lot! Get the best of both worlds - 1-level living plus a huge bonus finished basement w/ massive open recrm (pool table + home theater no problem), walkout, full bath, extra bedroom & den/storage. Inside, the foyer is roomy & leads to open kitchen/lr/dr with maple cabinets, maple hardwood, gorgeous slate-look tiles & large windows throughout. Kitchen has loads of storage & a terrific breakfast bar island. Master is spacious & has walk-in closet & full ensuite; secondary bedrooms are bright & have great closets. Lower level has monster recrm, large den/storage, great full bath & makes the house suitable for inlaws/extended family. Double-car attached garage makes for a great place to park & adds heated storage. With hardwood, quality laminate & tile throughout plus fresh paint, vinyl siding & all-vinyl windows, there’s nothing to do in this 10-yr-old home but move right in!